The phone has a 3D curved body on the rear side with a two-tone color-scheme that starts off being Black on the top and gradually transforms to an attractive and shimmery surface that Vivo has named ‘Starry Night’ color. The rear has dual rear cameras that are vertically aligned on the top left corner of the phone. The camera module has a metallic golden trim around it and below it is the LED flash. If you are wondering why I haven’t spoken about the fingerprint scanner, that is because this phone has an under-screen fingerprint scanner. This is the first time that the feature has been seen in a phone that costs less than 30k in India. This will be a great hit with the buyers. 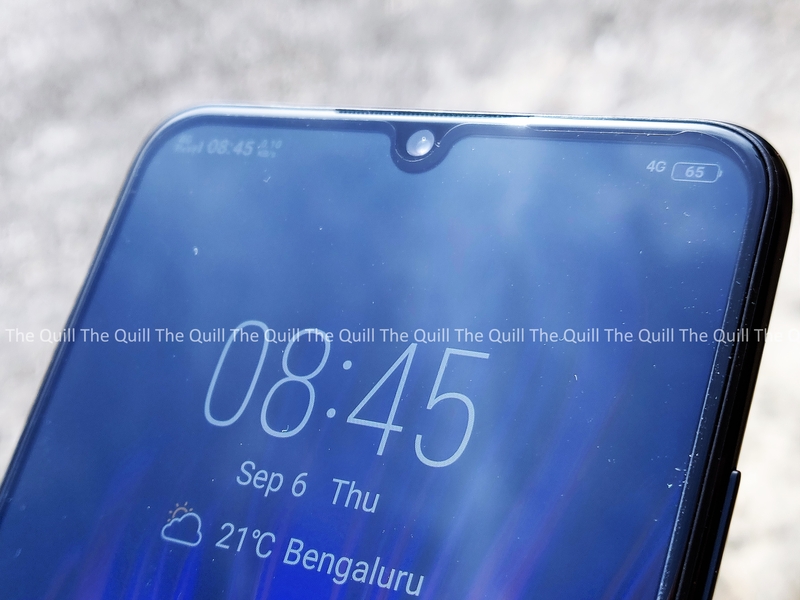 The 16.29 cm-big super AMOLED screen has a 19.5:9 aspect ratio and a 91.27% screen-to-body ratio and something Vivo calls the Halo Full-View display. This is an even better screen to body ratio than the Vivo Nex and even the iPhone X. The notch is very small and is what most people now fondly call the tear-drop notch. 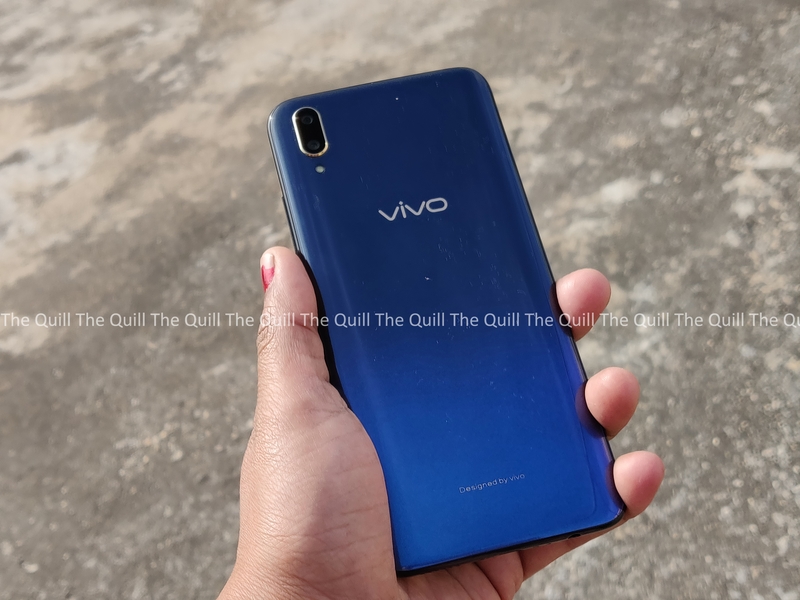 This makes the whole experience very good and Vivo have managed to somehow add even a earpiece and even an IR scanner for face recognition without adding too much weight and have succeeded in maintaining a pleasing design language. 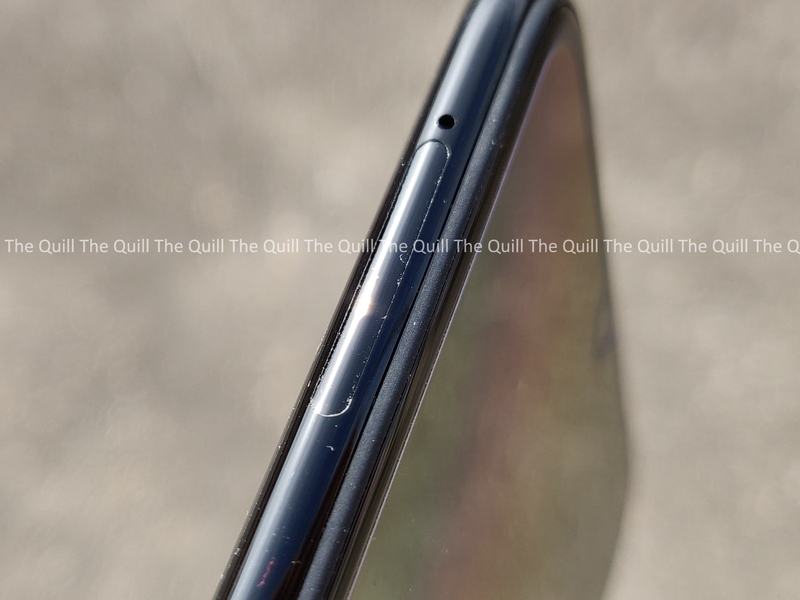 The rear curves around to the frame of the smartphone have the volume and power buttons on the side along with slots for the 3.5-mm headphone jack and speaker grille on the bottom. The smartphone still makes use of a Micro-USB port and not USB type-C. Having said that, the battery lasts mare than a day and charges up fast when needed. The in-display fingerprint works better on this device, much better than the Nex . There is also the infrared face-scan. This feature is very well implemented and works like a charm even in low-light conditions. 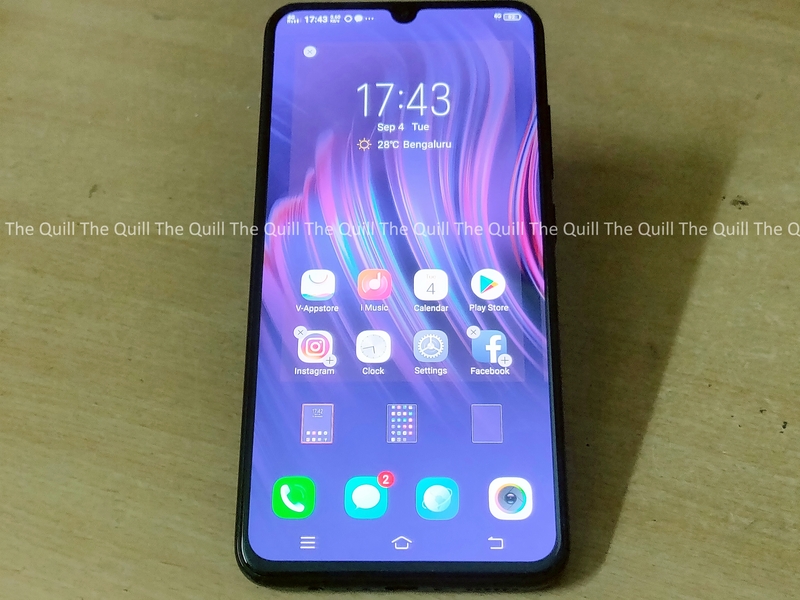 I have had endless issues with a lot of devices with the face unlock but the Vivo V11 Pro has a very fast and reliable face unlock. The device is pretty smooth in the performance area, and when I used multiple apps on it for a whole day and it handled the load without any trouble at all. Gaming was a breeze too and there was absolutely no stutter or frame drop to be seen at all. Video loops were handled very easily and there really was nothing that the phone could not handle. Performance and Load are handled very well. The in-display fingerprint sensor has improved speed and is very consistent and reliable. The Face unlock is supported by IR laser. It’s very visibly fast and works consistently even in dark conditions. When you place your finger on the screen for biometric scan, Face Unlock also kicks in and unlocks the phone instead. This is very nifty and thoughtful when it comes to practical scenarios. Vivo has given a very impressive phone at an very reachable price of Rs 25,990/- that brings a lot of great features from the Vivo line-up that are a first in the this price range. From my end – it is a definite buy. It brings a lot to the table where other brands have faltered and in a way, Vivo has thrown the gates open in this price range and it will now be interesting to see if other brands can match or beat this in the coming days.